Andrea Barqnani: Foreign players are always a bit of a mystery (e.g. the disappearance of Dino Radja, the meaning of "Boniface N'Dong"), but Barqnani is damn versatile; a 7-footer that can shoot the J and take people off the dribble. But 'Dre is softer than Alan Alda, scouts expect him to play all three frontcourt positions. He not be able to defend any of them. Raptors Expect: the next Dirk Nowitzki. 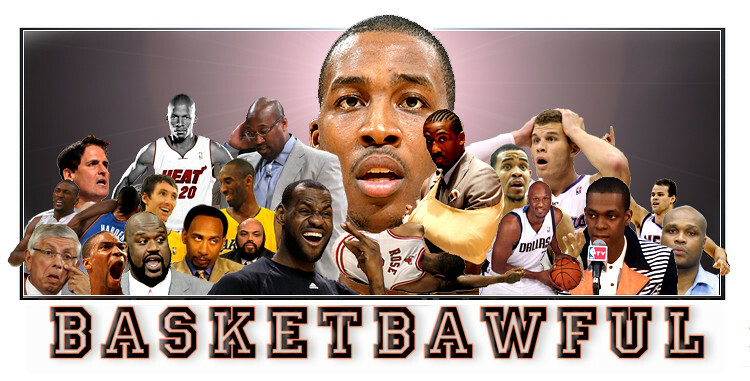 Basketbawful Expects: a poor man's Toni Kukoc. LaMarcus Aldridge: The fact that Portland traded Tyrus Thomas and Viktor Khryapa for another PF speaks volumes about the franchise's opinion of Zach Randolph. Aldridge is probably the best post scorer in the draft, but the Blazers should take notice of his average rebounding and block totals, despite being 6'11" and insanely athletic. Although moving Krhyapa off the roster should make up for this. Blazers Expect: Chris Bosh. Basketbawful Expects: Armon Gilliam. Adam Morrison: Much like being compared to Michael Jordan in the 90's, being endorsed by Michael Jordan these days is quickly becoming a precursor for disappointment (see: Kwame Brown, Jamal Crawford). Scouts gush over his Larry Bird-esque intensity and intelligence on the offensive end. Basketbawful wishes the media would come up with a new comparison for jump-shooting white guys. Bobcats Expect: Increased ticket sales. Basketbawful Expects: Wally Szczerbiak, without the range (only 36% on 3's in college, 76% on FTs). Tyrus Thomas: It's hard to get enthusiastic about this one. Big Baby can jump out of the gym, but we see an undersized PF that dunks everything in sight and has no low-post game whatsoever. We've been hearing nothing but comparisons to fellow LSU alma mater Stromile Swift, and that's hardly a compliment. Bulls Expect: Stromile Swift. Basketbawful Expects: Tyson Chandler...but shorter! Shelden Williams: Shelden is a banger, shot blocker and is a decent scorer in the post. He played 4 years of college and should contribute right away. Which makes the fact that Atlanta drafted him that much more mystifying. Hawks Expect: Buck Williams. Basketbawful Expects: The Hawks to screw this up somehow. Portland Tradeblazers: Portland made 49 trades on draft night and landed LaMarcus Aldridge and Brandon Roy, who are arguably better prospects than any of the players they dealt. On the downside: they managed to hang onto Darius Miles and Zach Randolph, and are now stuck with Raef Lafrentz. New York Knicks: Isiah has a CBA flashback and drafts Renaldo Balkman, a player who, on the surface, seems worthy of the Rockford Lightning. But, when you take a closer look, they probably wouldn't have taken him either. Isiah Thomas, Western Conference: Kevin McHale continued his fixation on stumpy shooting guards (last year's drafting of Rashad McCants, Troy Hudson's inexplicable job security) by trading early ROY candidate Brandon Roy for 6'3" Randy Foye. Historically, undersized 2's have struggled mightily in the NBA. But if things go well: Foye could be the next Tony Delk. Wouldn't that be awesome. Boston Celtics: Delonte West was probably their 2nd best all-around player last year, and is justly rewarded by bringing in Sebastian Telfair and Rajon Rondo to vie for his PT at the point. But at least Raef is gone. Houston Rockets: Played the part of Santa Claus this draft by trading Rudy Gay and Stromile Swift to Memphis for Shane Battier. A role player swap, with a lottery pick...thrown in?!? I may be missing something, but I doubt it. Our prediction: Rudy Gay makes all-rookie first team, while Houston is again wondering who will pick up the slack while Tracy McGrady is on the injured list. Golden State Warriors: It took exactly one minute for Dan Patrick to label Patrick O'Bryant a "project". Which means: they finally found a backup for Adonal Foyle and Andres Biedrins. Seattle Sonics: Mouhamed Saer Sene? The Sonics draft their 3rd straight project that's greener than grass and has almost no organized b-ball experience. Johan Petro and Robert Swift will take Sene under their wing and share their years (well, year.) of experience. Good thing Giant Gonzalez wasn't on the board. Orlando Magic: JJ Redick: Hopefuls say he'll carve himself a niche as a spot-up shooter. We think it'll take a helluva lot of shooting to hide the fact that he's short, can't run the point or stay in front of a Coke machine. Best Case Scenario: Voshon Lenard...? More Likely: In 2009, he'll be playing Trajan Langdon's team for the Euroleague championship. The Steal of the Draft: The Jazz get a bargain at 14 with Ronnie Brewer, a combo 2/3 that does a little bit of everything. Basketbawful Expects: All-Rookie 1st team if he starts. Salt Lake City will finally wash that Deshawn Stevenson taste out of their mouth, but the rest of the country will still get Matt Harpring and Gordan Giricek confused. Great post. All the best from Spain!! Big Baby, huh? Boo this blog! Still waiting for the Big Baby correction and sincere apology. You're in for a long and painful wait. Your syphilis will probably clear up before you see an apology posted here. This blog doesn't walk little old ladies across the street. Being "nice" isn't our thing. As for the nickname mixup, well, I'm sure Glen Davis doesn't mind. And if Thomas doesn't want to be inexplicably labeled with someone else's nickname, he needs to get his own. Or start fighting crime. Then I'll consider amending this post. My bad. I always get NBDL players confused. Tyrus Thomas' nickname is T-Time. Unoriginal and not very catchy? Yes, but 100% accurate, unlike this blog. Look it up research dept.